The Sacrament of Penance is heard one half hour prior to the Divine Liturgy. For the Mysteries (the Sacraments) of Baptism, Chrismation, Holy Eucharist, Anointing of the Sick, and Marriage, please speak with Father Iura. Kindly notify the rectory office about parishioners who are confined to home, hospital, or convalescent home, so that Father Iura may visit them with the sacraments. Sacrament of Anointing of the Sick brings healing to the infirmities of both body and soul, as God sees fit, through the anointing of holy oil and prayer. 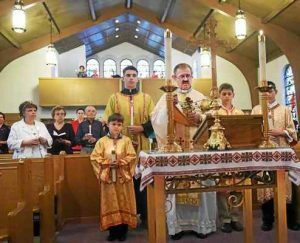 Various liturgical services are held in preparation for the Nativity of Our Lord. The Liturgy of the Presanctified Gifts is at 7:00 p.m.
During Lent and the Easter season the Church prays for our beloved dead. Father Iura yearly announces the dates for the Sorokousty (All Souls Days) on which special prayers are offered in remembrance of those who have died. Let us remember all our loved ones who have gone to their heavenly reward. Eternal Memory! The word Ukrainian word “Sorokousty” means “forty mouths” (sorok = forty; ust = mouth). Originally, this was a prayer service offered by forty mouths or by forty priests. Historically, families would honor their deceased by holding services for them in the cathedrals on the 3rd, 9th and 40th day after their death —with 40 priests celebrating the services. Today, Sorokousty is the service that honors the deceased and is offered during Lent.